Description of "Best Legit Ways To Make Money Online (eBook)"
THis book is very useful those people to want make money online for self employed . 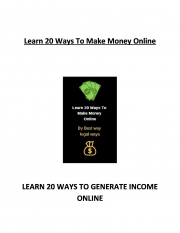 this book learn how to make money online with home.This short e-book was written to help people get started setting up multiple streams of income online in one week or less. I will show you the ONE strategy I used to make money online and create an income that is currently growing and growing. the author of this book is a software engineer born on 4 november 1997 and in rajasthan. Ankit Bohra the author of this book is a software engineer is going to give some knowledge to her audience to how to make money online 20 legits way to make money online this book is very good for people who want to know that how to make money online. Reviews of "Best Legit Ways To Make Money Online (eBook)"